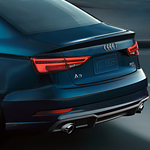 The Audi A3's 2.0-liter turbocharged TFSI® engine delivers 186 horsepower and 221 lb-ft of torque. The robust quattro® all-wheel drive option, with 220 horsepower and 258 lb-ft of torque, propels you from 0-60 mph in just 5.8 seconds. The AWD model won't have you soaring over sand dunes or churning through mud and rocks, but it does offer better traction on slippery surfaces, and it can help you out when you have two wheels stuck. Don't take our word for it. You're welcome to come down to Audi Wyoming Valley and take an Audi A3 sedan for a test drive and feel the power for yourself. It's the best way to experience its great interior, design, and safety features.